Yesterday was our second attempt at the anatomy scan and all is well, but Baby H is still evading the paparazzi, as she has at the last 3 ultrasounds. I joke that being a happy and highly allergic person, I laugh and sneeze all day, and it has turned her into the most unflappable baby ever. 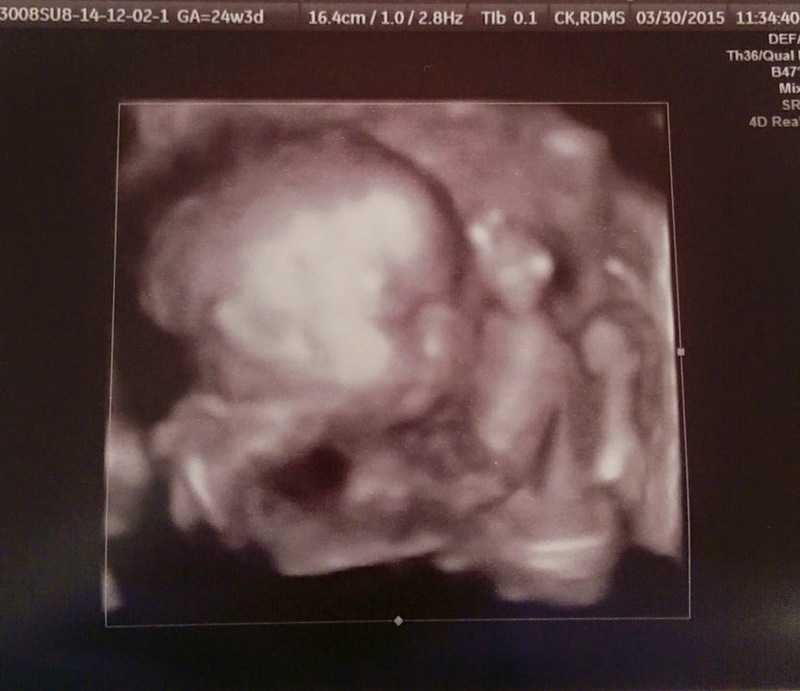 No amount of poking from the ultrasound tech gets her to shift position. Like Calvin on picture day, we have a long strip of blurry photos, but managed to get one halfway decent one. From all other angles you can see that she is rolled up in a ball like a pillbug with her arms in front of her face. Francis thinks that 3D ultrasounds look like the baby is sculpted from mashed potatoes, and I tend to agree that they look pretty weird. Go figure, though, when it's your own baby they look amazing and perfect and not at all like mashed potatoes. I kept pulling this picture up all day yesterday. She looks just like us! MAGIC! Can you believe she is only about 1lb 9oz right now? Week 24 is when they can survive outside the womb with medical intervention, so basically she's just growing for the next 16 weeks or so. I've had a lot of people ask me for updates, and here I am at week 24 feeling like this is all I have to offer. I have no complaints, which is what I feel people (especially moms) expect when they ask how you feel. Other than the occasional bout of insomnia (which could be managed 9 out of 10 times by putting my smartphone away an hour before bed), a little reflux (which could be managed by a walk after dinner), and a little joint stiffness (which could be managed with more swimming if I would just buy a new swimsuit), I've had a blessedly easy time thus far. Of course, that is due in no small part to starting my own business and being able to nap when I need to, exercise when I want to, and work wherever I please. I highly recommend it!